Similar to our plain boxes and cartons the printed boxes and cartons are made from approximately 75% recycled material and are 100% recyclable. They’re ideal for selling into the retail market or promoting your company and creating brand awareness. Lowest cost – Flexo – Up to four colours. Ideal for transit cartons and shelf-ready packaging. Screen printed box – Ideal for higher quality display, point-of-sale, and retail in-store cartons. Up to four colour process. 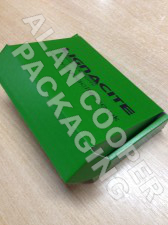 High-quality printed box – The top-end – Litho-laminate – Photographic finish. For high value goods and presentation. Up to four colours. Ideal for transit cartons and shelf-ready packaging. Ideal for higher quality display, point-of-sale, and retail in-store cartons. Up to four colour process. Photographic finish. For high value goods and presentation.